Comfort is key for BBQs since it's really all about the food & fun, so white denim shorts & a lightweight chambray top were perfect for the occasion. (On a really hot day, you might want to try a chambray tank!) Flat sandals are a must if you plan to be walking around in the grass. Sam Edelman makes the cutest & comfiest pairs of metallic sandals. To finish off the look, I stole my sister's striped tote bag. This is a great bag for carrying ALL of your daily essentials whether it be a work day, beach day or BBQ. This bag is guaranteed to fit it all. What's your favorite part of BBQs? 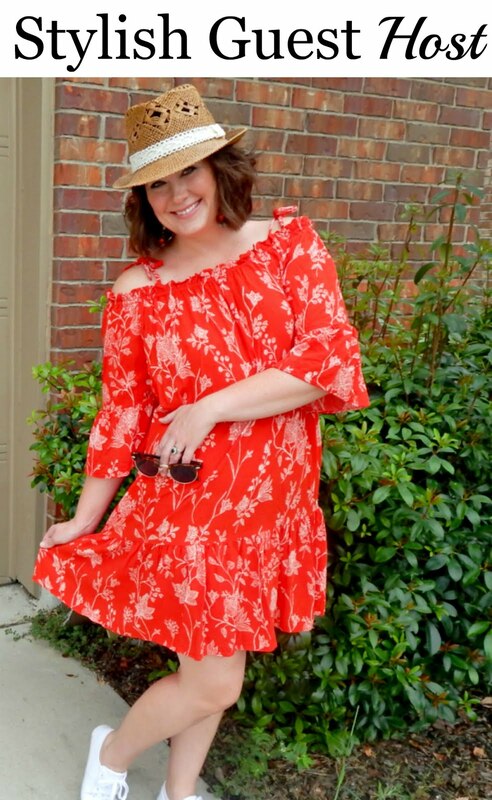 Say hello to our guest host for this week's Start The Week Stylish linkup: Carey from Drew & Alice. Carey is a fashion and beauty blogger who named her blog after her favorite literary characters Nancy Drew & Alice in Wonderland (how cool is that?!). Be sure to stop by her blog this week and say hello! 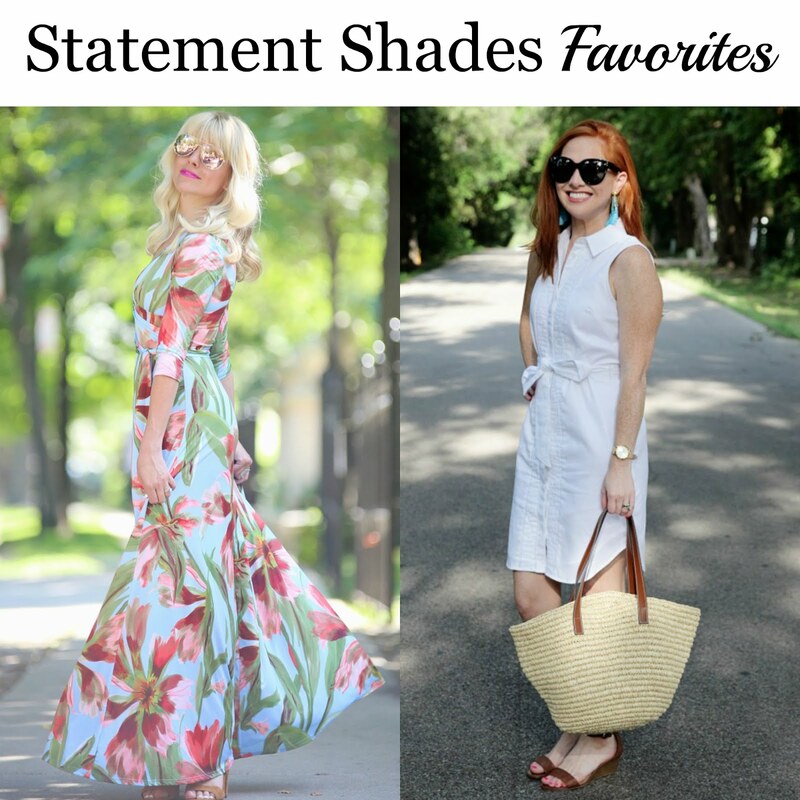 Last week, we loved Johanna from 101 Things I Love & Adriele from Style Assisted's statement sunnies. 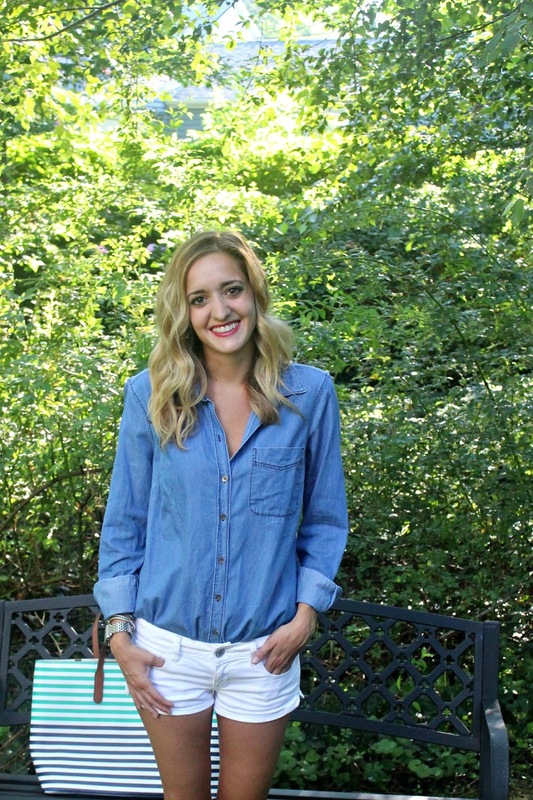 I think a chambray shirt is ideal for many occasions!! In fact, don't laugh but we're doing a series on them next month! I love how they are casual neutral but very stylish!! The bag & gold sandals add some nice elements to this Michelle!! And who doesn't love BBQ food? I'm right there with you! I agree! It's one of my go to pieces when I don't know what to wear for all seasons! BBQs are definitely one of the best parts of summer, and this is the perfect outfit for one! LOVE a good BBQ and you look fantastic and Summer cool!! 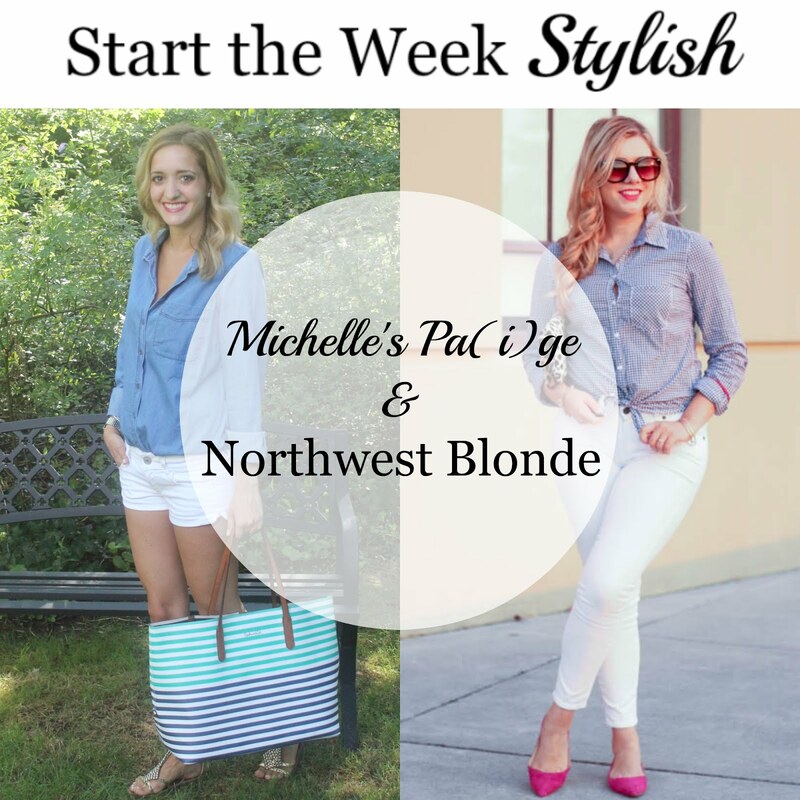 Perfect cute casual look Michelle! Love love love that tote! Such a pretty color combo! Perfect for the outfit. Such a great look! Love your tote! This is my favorite summer look - so casual and cool! Such a perfect outfit for summer bbq, casual and chic and elegant. I love your shoes, well I love the whole look to be honest. Perfect look for a Summer BBQ. You look amazing in those shorts! This look really is perfect for summer - there's no better combo than white and chambray. I totally agree too - BBQs are one of the best things about summer. Especially when they involve outdoor games. Yes! We just discovered Ladder Ball this summer! Have you played? It's so much fun! Love this casual look! That bag is so cute! Those really are the cutest sandals, but I also love that oversized bag! BBQs define our summer! Cute look on you! Thank you for the shout out...you made my day! We loved your look from head to toe! I live for casual summer bbqs and outfits like this one! Your outfit is perfect for it! BBQ are so fun and great for summer! Your outfit is perfect for such an occasion I love it! This exact outfit is one of my uniforms for an off Summer day. And great striped tote!